Battle Saw Toy Plastic Gun is a unique static prop that can be used with a variety of cosplay costumes, such as the top secret espionage Operation Rapidstrike roleplay game Red Sector line. 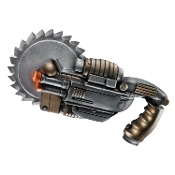 Made of plastic, this Halloween steampunk inspired toy costume accessory features intricate details and a pistol grip. It can help you complete the costume look of a futuristic, post-apocalyptic warrior, zombie hunter or other cosplay character. Prop does not have any moving parts. Toy fake weapon does not make any sounds.